With our expertise in the respective field, we are engaged in manufacturing, retailing and exporting an extensive range of Embedded Systems. At our sophisticated manufacturing unit, all the products are developed using high grade raw material with the help of our experienced technicians. As per the application requirements of our clients, all the products are developed in numerous technical specifications. Our team of quality auditors tests the final range on well-defined parameters so as deliver only flawless products to our valued clients. 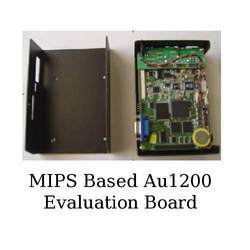 We offer technologically advanced range of Evaluation Board, which is a complete board for developing advanced embedded systems. This board is useful to drive audio, video, pictures as it supports digital media broadcast and digital video broadcast (DVB) formats and global positioning system (GPS) requirements. In order to meet all the requirements of our clients, the board provides high performance and ensures low power consumption. Besides, it shortens the design cycles so as to deliver new products in the global market. Looking for Embedded Systems ?